The women of Paris had no desire to renounce a cherished ornament, and they were clever enough to effect a compromise when it became known that theatrical managers were thinking seriously of forbidding the wearing of hats in their houses. An alternative which seemed hard enough was finally offered. "The hat must be small or there will be no hat at all," was the edict. And, thanks - so the Parisienne feels - to a number of women who by their name, rank, and elegance are able to control the styles, there will be a hat, but it will be small. Apart from the theater problem, another danger which bade fair to assume formidable proportions was beginning to threaten the large hat. The Parisiennes were somewhat astonished to learn, last spring, that a number of prominent men were organizing to banish headgear of undue proportions at all times and from all places. Conspicuous in the movement was M. Lepine, the prefect of police. Just why this official should consider the big hat a menace to law and order in the community was not altogether clear, but the weight of his name was sufficient indication that some reform was necessary. The Comtesse Greffulhe, born of the noble and powerful family of La Rochefoucauld, took the initiative. She laid the matter before several of her friends, and they in turn appealed to others whose acknowledged elegance would probably permit them to institute a dress reform. Finally the most renowned milliners were consulted. 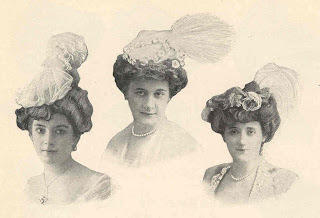 It was agreed that the small hat might be forced into next season's styles, and, adopting the idea, all turned their attention to inspiring and designing models of theater hats which would meet objections. These were then put on public exhibition, and all Paris filed before them - to gaze in appreciation, to criticize, to suggest improvement, and, finally, to adopt them. There was, of course, a degree of opposition - skepticism in some quarters, open hostility in others. Certainly a large hat is more becoming than a small one. It throws softening shadows over the face, and gives it a much-sought-for "character." In the glaring light of theater-halls, amid gilt decoration and furnishing of strong color, it may easily be seen that small hats and bonnets would make but little effect. Nevertheless both skeptics and opponents renounced their smiles and their jeers when they had been to the Rue d'Astorg. and had examined the marvels destined to replace the vanished glories of the big hat; and it was noted in some cases that the very ones who had proclaimed their attachment to last season's headgear were among the first to invest heavily in the little hats of the coming autumn. Such is the history of The League of Little Hats - a really sensible reform in feminine attire effected by the combined efforts of women of fashion and the milliners. Of course no one woman could have accomplished this, and the League of the Little Hats points to what is probably the only satisfactory method of obtaining any desired reform in dress. One difficulty in the path of reform in women's dress has always been that practical dressmakers and milliners have rarely been heeded or consulted. Many attempts have failed because the proposed costume has lacked the necessary element of beauty, which the skilled designer of clothes would be able to give. 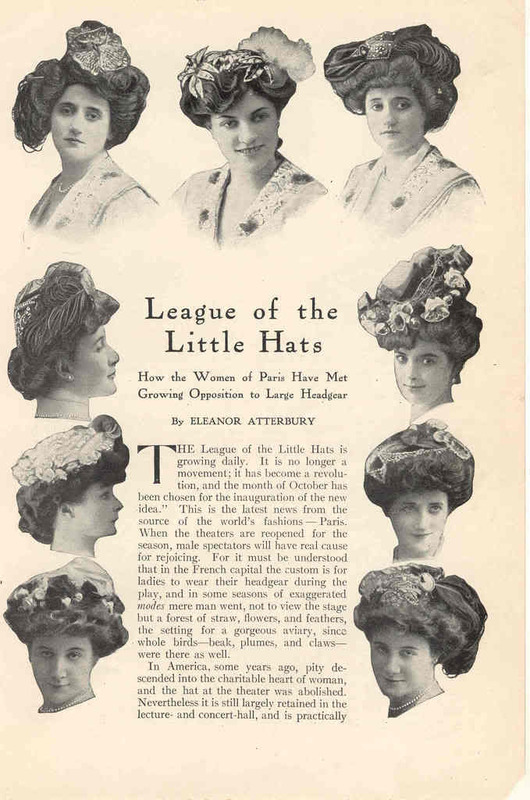 The organizers of the League of the Little Hats had the wisdom to do nothing without the help and advice of the most famous milliners in the world. Yet in this instance the exquisite taste of the Parisian women of fashion was shown by the fact that their own designs rivaled in popularity those of professional makers of hats. At the sale in the Rue d'Astorg the most-sought-for models included the designs which the Duchess de Guiche, the Marquise de Jaucourt, the Comtesse Edmond de Pourtales, the Comtesse Lafont, the Marquise de Mun, the Comtesse Greffulhe, and Mme. Strauss had planned and furnished. The Parisian milliners have been busy all summer preparing innumerable new models, with which even now their shop windows are blooming. Blue tulle is a favorite material, as is also the diadem of gold lace. Wreaths of small roses are on many a charming creation, and the uncurled ostrich plume, in possession of which the wearer can brave the terrors of dampness, is used often with beautiful effect. The exhibition of the League was an instantaneous success; and no one will deny, after looking at the models reproduced with this article, that it was a deserved one. 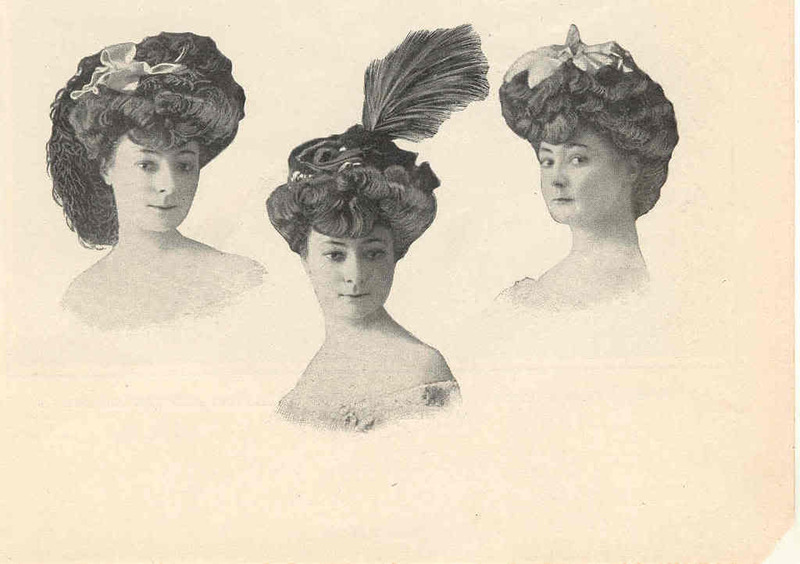 The hats were purchased at excellent prices, and so great was the demand that one model sold thirty times. In order to commemorate the inception of the League, the entire proceeds of this, its first sale, were turned over to a prominent charitable organization - La Societe Philanthropique. This was, moreover, a tribute to the founder of the League, for Comtesse Greffulhe is also one of the most generous and interested patronesses of the philanthropic society. Originally published in the Cosmopolitan Magazine, October 1906.